The first of these studies emerged in 2011 from Stanford pollster Jon Krosnick and his colleagues….Both Democrats and independents strongly favored a green candidate over a neutral one, while for Republicans it was basically a wash—neither a pro or anti-climate candidate moved them much. “By taking a green position on climate, candidates of either party can gain votes,” Krosnick’s team concluded. ….Their findings were reinforced earlier this year by researchers at Yale and George Mason who, in a March 2012 survey, similarly found that taking a stand on climate has the potential to motivate Democratic and independent voters, without causing damage among Republicans. …. In a survey of 1,204 likely voters in May of 2012, [Andrew] Maxfield found that a “clean energy” candidate fared better than an “all-of-the-above” candidate who supported a variety of energy choices—coal, drilling, and also clean energy. Maxfield then went on to test a variety of climate messages—and the upshot, he says, is that “if you feel strongly about climate change, there is a way to talk about it that voters will understand and appreciate”—especially if candidates focus on recent extreme weather. “I was surprised at the strength of that, and the extent to which voters had begun to recognize the severe weather, and experience it,” Maxfield says. Unfortunately, I remain skeptical. In a vacuum, supporting green policies has always been a popular position. And it’s always been true that there are good ways to talk about climate change and bad ways. I’m not sure anything big has changed here. The problem is that you don’t always get to talk about political issues the way you want to. Your opponents get to talk about them too. And they won’t be shy about labeling virtually any serious green policy as a price hike for consumers and a regulatory burden for business. What’s more, conservatives have an unusual advantage when they say this: it’s actually true. Things like carbon taxes and cap-and-trade policies really will increase the price of energy for consumers. That’s the whole point. Conversely, if you limit yourself to generally popular issues like CAFE standards and building more solar plants in the desert, voters will support it, but only because the price hike is small enough (and hidden enough) that it has only a modest impact on climate change in the first place. What really matters, then, is what happens when potential voters are presented with messaging from both sides. To get an idea of how effective this is, take a look at the Gallup polls below. The first poll asks people if the threat of global warming is generally exaggerated or not, and it hits bottom in 2006, at about the time of the release of Al Gore’s An Inconvenient Truth. Then it starts to rise as conservatives fight back, reaching a peak in 2010, shortly after the release of the “Climategate” emails. It’s gone down since then, which is good news, but it’s still way higher than it was even five years ago. 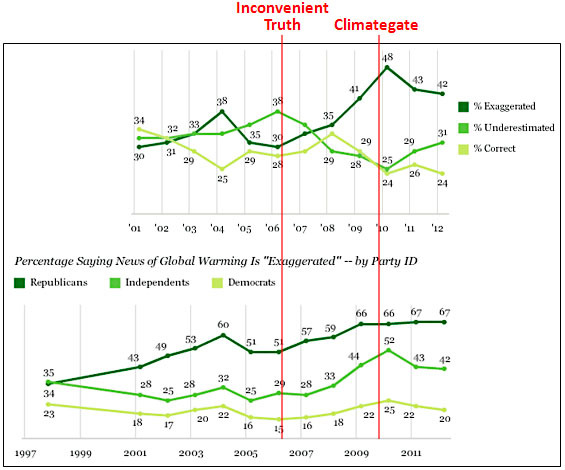 Likewise, the bottom chart shows that even Democrats and Independents are far more likely to think that news of global warming is exaggerated than they were back in 2006. So there’s a long way to go before public opinion is anywhere near where it needs to be. We need to get to a point where even if people know that it means an increase in gasoline and electricity prices — even if their noses are rubbed in it — they still support serious green policies. This is the work ahead of us.